Even a cursory review of Kenyan daily news coverage shows that corruption at all levels (from county to national) and in all its forms (from bribes to graft) is a major issue of concern for the country. Many commentators express frustration at the extent of the problem and the dearth of constructive solutions. Against that background, CIPE and its partner organization, the Kenya Association of Manufacturers (KAM), are working to help change Kenya’s corruption-tainted narrative and provide the private sector with tools to proactively build integrity into business operations. To that end, CIPE, KAM, and Global Compact Network Kenya (GCNK), where KAM serves as the secretariat, created a joint training program for Kenyan companies on anti-corruption compliance. 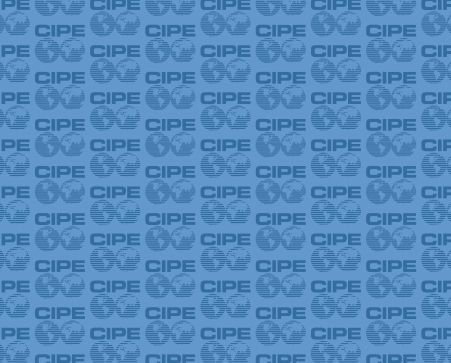 The training is based on CIPE’s Anti-Corruption Compliance: A Guide for Mid-Sized Companies in Emerging Markets and was adapted to the unique needs and concerns of local businesses. As KAM’s Chairman Pradeep Paunrana put it, “You cannot clap with one hand, it takes two people to make a corrupt deal.” Through this initiative, Kenya’s private sector is taking responsibility for holding itself to a higher standard and disrupting the “supply side” of corruption. The new training program was officially launched at a high-level CEO Dialogue Breakfast held on March 24 in Nairobi. I had the pleasure of speaking at the launch event on a panel with representatives from PWC and Safaricom. Attorney General of the Republic of Kenya Prof. Githu Muigai delivered keynote remarks. He noted that Kenya was in the process of adopting the Bribery Bill (spearheaded by CIPE’s other local partner, the Kenya Private Sector Alliance) similar to the UK Bribery Act, which would require companies to set up codes of conduct and put in place anti-bribery risk management systems. In his memo to the Cabinet explaining the rationale for the bill, the attorney general said “the bill contains far-reaching anti-bribery provisions whose implementation will lead to drastic reduction of bribery, in particular, and corruption generally, in all the sectors of the Kenyan economy.” Once approved by Parliament and implemented, the bill will become an important element in Kenya’s fight against corruption, addressing both the demand and the supply sides of the problem. Encouragingly, Kenya’s private sector is ready to step up to the challenge, and the joint CIPE, KAM, and GCNK anti-corruption compliance training provides a practical way for companies to translate integrity commitments into action. The inaugural training workshop is scheduled on April 27-28 in Nairobi. Anna Kompanek is Director for Multiregional Programs at CIPE.